They don't have to break into a collective rendition of that famous Toy Story song, "You've got a friend in me," for trio Marco Reus, Mario Götze and Andre Schürrle to let fans know they are once again making beautiful music together, it's enough to just watch Borussia Dortmund's best of buddies bewilder us with their in-tune footballing talents. "You've got troubles, and I've got 'em too, we stick together and can see it through:" so the soundtrack goes, and how these three amigos have had to support one another through many moments of melancholy during recent times. Reus only recently returned from a 259-day cruciate injury layoff to join best mate Mario Götze in a Matchday squad for the first time in a year. Schürrle's problems have also been well documented, the 27-year-old enduring various injury setbacks that badly affected his form. As for Götze, recovering from a metabolic disorder only to succumb to a serious ankle setback hurt like hell for the midfield maestro. Watch: The three amigos: Schürrle, Reus and Götze! But now back together, fitter than ever and singing the same score, it's unsurprising to see Dortmund's gradual rise back toward top form with this brilliant trio confidently pulling some crucial strings for a Black and Yellow outfit grateful to have the Germany internationals on board. "Playing for Germany, we'd joked about maybe doing the same at club level. We didn't really think it would happen," Reus explained of how even the possibility of teaming up on the domestic front raised a thrill. Skip ahead to the present moment, however, and the collective smiles tell a tale of teamwork, on-field rewards and and testing times overcome. Chasing to fulfil end of season aims after a troubled opening to the campaign, Dortmund are plotting a course to finish in the top two positions in the Bundesliga while a tilt at European glory via the UEFA Europa League is helping to add to the increased confidence at the Westfalenstadion. Indeed, it was during the team's impressive 3-2 win against Atalanta in the Europa League that the new-found morale buzzing through the club under recently appointed coach Peter Stöger could be felt, with Schürrle, Reus and Götze all chipping in with key contributions to add to on-loan striker Michy Batshuayi's crucial goals. "He's getting back to normal, he is starting to produce the quality that he has," Stöger said of Schürrle, who opened the scoring against the Serie A side. "After a difficult period with injuries, he is now getting the playing time, confidence and opportunities. He's showing his standout qualities more and more." Götze, meanwhile, weighed in with two fine assists - one right at the death - as BVB earned a crucial victory to take to Italy for the return leg on 22 February. "In stoppage time I could see Michy Batshuayi unmarked in the penalty area and played it straight to him. And then he did brilliantly, turning like lightning and finishing." That goal was Batshuayi's fifth in three appearances for a Dortmund side now unbeaten in their last six games. Should the Chelsea loanee keep up that scoring rate, he might even be welcome into the special Schürrle/Götze/Reus brotherhood. "Mario Götze served me up the passes so well," the Belgian international explained after helping his side come from behind to beat Atalanta. And with that, as the quartet went into the Dortmund night, we'd like to think they were humming the final lyrics to one of cinema's most famous tunes. "And as the years go by, our friendship will never die; you're gonna see it's our destiny, you've got a friend in me." 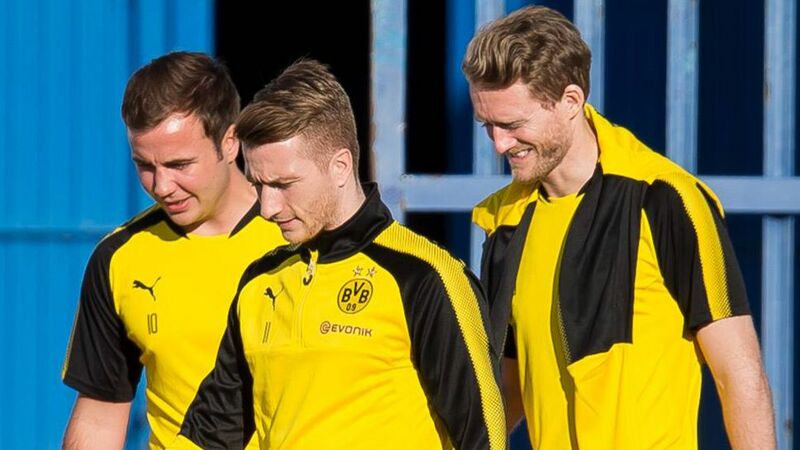 Click here for more Dortmund news, views and features!